James Prescott Joule, (December 24, 1818 – October 11, 1889), Fellow of the Royal Society, was an English physicist, born in Sale, Cheshire. He discovered that heat and mechanical energy are inter-convertible, and that transformations from one to the other occur in a fixed proportion, known as the mechanical equivalent of heat. His careful experiments helped overthrow the prevailing "caloric theory" of heat, a theory that had hampered scientific progress. Joule's researches were guided by his religious convictions. His speeches often included references to God and God's creation. The son of Benjamin Joule (1784–1858), a wealthy brewer, Joule was tutored at home until 1834, when at the age of 15, he was sent, with his elder brother, Benjamin, to study with John Dalton at the Manchester Literary and Philosophical Society. The pair only received two years' education in arithmetic and geometry when Dalton was forced to retire owing to a stroke. However, Dalton's influence made a lasting impressions as did that of his associates, chemist William Henry and Manchester engineers Peter Ewart and Eaton Hodgkinson. Joule was subsequently tutored by John Davis. Joule was fascinated by electricity. He and his brother experimented by giving electric shocks to each other and to the family's servants. Joule became a manager of the brewery and took an active role until the sale of the business in 1854. Science was a hobby but he soon started to investigate the feasibility of replacing the brewery's steam engines with the newly-invented electric motor. In 1838, his first scientific papers on electricity were contributed to Annals of Electricity, the scientific journal founded and operated by Davis's colleague, William Sturgeon. He discovered that the heat generated by an electric current is proportional to the square of the current and to the resistance, a relationship known as Joule's law,, and hoped to impress the Royal Society but found, not for the first time, that he was perceived as a mere provincial dilettante. When Sturgeon moved to Manchester in 1840, Joule and he became the nucleus of a circle of the city's intellectuals. The pair shared similar sympathies that science and theology could—and should—be integrated. Joule went on to lecture at Sturgeon's Royal Victoria Gallery of Practical Science. He also published a paper in Sturgeon's Annals of Electricity demonstrating that the work performed by an electric motor was not enhanced by changing the construction or size of the battery used to supply the electrical current. In the same year, he communicated to the Royal Society a paper, "On the Production of Heat by Voltaic Electricity," in which he demonstrated that the heat produced by a chemical reaction can manifest itself instead in the energy generated by an electric motor or by heat generated in electrical resistance in a circuit. Joule tried to explain the phenomena of electricity and magnetism in terms of atoms surrounded by a "calorific ether in a state of vibration." Joule's interest moved from financial considerations to the question of how much work could be extracted from a given source, leading him to speculate about the convertibility of various forms of energy into one another. In 1843, he published results of experiments showing that the heating effect he had quantified was due to generation of heat in the conductor and not its transfer from another part of the equipment. This was a direct challenge to the caloric theory which held that heat could neither be created or destroyed. Caloric theory had dominated thinking in the science of heat since introduced by Antoine Lavoisier in 1783. Lavoisier's prestige and the practical success of Sadi Carnot's caloric theory of the heat engine since 1824, ensured that the young Joule, working outside either academia or the engineering profession, had a difficult road ahead. Carnot had demonstrated that the work produced by a heat engine such as a steam engine was dependent on the high and low temperatures between which it operated, and that there was a maximum efficiency that could be achieved between any two temperatures. While his paper was written in terms of the caloric theory, an examination of his personal papers after his death revealed that he had arrived at conclusions regarding the nature of heat that were virtually identical to Joule's. … the mechanical power exerted in turning a magneto-electric machine is converted into the heat evolved by the passage of the currents of induction through its coils; and, on the other hand, that the motive power of the electro-magnetic engine is obtained at the expense of the heat due to the chemical reactions of the battery by which it is worked. Further experiments and measurements by Joule led him to estimate the mechanical equivalent of heat. According to Joule's findings, the energy required to raise the temperature of a pound of water one degree Fahrenheit (a quantity of heat called the British thermal unit) was the same as that required to raise a pound of water 838 feet. He announced his results at a meeting of the chemical section of the British Association for the Advancement of Science in Cork in 1843, and was met by silence. Joule was undaunted and started to seek a purely mechanical demonstration of the conversion of work into heat. By forcing water through a perforated cylinder, he was able to measure the slight viscous heating of the fluid. He obtained a mechanical equivalent of 770 foot pounds per British thermal unit. The fact that the values obtained both by electrical and purely mechanical means were in agreement to at least one order of magnitude was, to Joule, compelling evidence of the reality of the convertibility of work into heat. Joule now tried a third route. He measured the heat generated against the work done in compressing a gas. He obtained a mechanical equivalent of 823 foot pounds. In many ways, this experiment offered the easiest target for Joule's critics, but Joule disposed of the anticipated objections by clever experimentation. However, his paper was rejected by the Royal Society and he had to be content with publishing in the Philosophical Magazine. In his 1845 paper, Joule was forthright in his rejection of the caloric reasoning of Carnot and Émile Clapeyron but his theological motivations also become evident. I conceive that this theory … is opposed to the recognised principles of philosophy because it leads to the conclusion that vis viva may be destroyed by an improper disposition of the apparatus: Thus Mr Clapeyron draws the inference that 'the temperature of the fire being 1000°C to 2000°C higher than that of the boiler there is an enormous loss of vis viva (mechanical energy) in the passage of the heat from the furnace to the boiler.' Believing that the power to destroy belongs to the Creator alone I affirm … that any theory which, when carried out, demands the annihilation of force, is necessarily erroneous. Joule's apparatus for measuring the mechanical equivalent of heat. In 1845, Joule read his paper, "On the mechanical equivalent of heat" to the British Association meeting in Cambridge. In this work, he reported his best-known experiment, involving the use of a falling weight to spin a paddle-wheel in an insulated barrel of water, whose increased temperature he measured. He now estimated a mechanical equivalent of 819 foot-pounds per British thermal unit. In 1850, Joule published a refined measurement of 772.692 foot-pounds per British thermal unit, closer to twentieth century estimates. Much of the initial resistance to Joule's work stemmed from its dependence upon extremely precise measurements. He claimed to be able to measure temperatures to within 1/200 of a degree Fahrenheit. Such precision was certainly uncommon in contemporary experimental physics, but his doubters may have neglected his experience in the art of brewing and his access to its practical technologies. He was also ably supported by scientific instrument-maker John Benjamin Dancer. However, in Germany, Hermann Helmholtz became aware both of Joule's work and the similar 1842 work of Julius Robert von Mayer. Though both men had been neglected since their respective publications, Helmholtz's definitive 1847 declaration of the conservation of energy credited them both. Also in 1847, another of Joule's presentations at the British Association in Oxford was attended by George Gabriel Stokes, Michael Faraday, and the precocious and maverick William Thomson, later to become Lord Kelvin, who had just been appointed professor of natural philosophy at the University of Glasgow. Stokes was "inclined to be a Joulite" and Faraday was "much struck with it" though he harbored doubts. Thomson was intrigued, but skeptical. Unanticipated, Thomson and Joule met later that year in Chamonix. Joule married Amelia Grimes on August 18, and the couple went on honeymoon. Marital enthusiasm notwithstanding, Joule and Thomson arranged to attempt an experiment a few days later to measure the temperature difference between the top and bottom of the Cascade de Sallanches waterfall, though this subsequently proved impractical. … the conversion of heat (or caloric) into mechanical effect is probably impossible, certainly undiscovered. But a footnote signaled his first doubts about the caloric theory, referring to Joule's "very remarkable discoveries." Surprisingly, Thomson did not send Joule a copy of his paper but when Joule eventually read it he wrote to Thomson, claiming that his studies had demonstrated conversion of heat into work but that he was planning further experiments. Thomson's reply revealed that he was planning his own experiments and hoping for a reconciliation of their two views. Though Thomson conducted no new experiments, over the next two years, he became increasingly dissatisfied with Carnot's theory and convinced of Joule's. In his 1851 paper, Thomson was willing to go no further than a compromise and declared, "the whole theory of the motive power of heat is founded on … two … propositions, due respectively to Joule, and to Carnot and Clausius." As soon as Joule read the paper he wrote to Thomson with his comments and questions. Thus began a fruitful, though largely epistolary, collaboration between the two men, Joule conducting experiments, Thomson analyzing the results and suggesting further experiments. The collaboration lasted from 1852 to 1856, its discoveries including the Joule-Thomson effect, and the published results did much to bring about general acceptance of Joule's work. Joule was a pupil of Dalton and it is no surprise that he had learned a firm belief in the atomic theory, even though there were many scientists of his time who were still skeptical. He had also been one of the few people receptive to the neglected work of John Herapath on the kinetic theory of gases. This theory maintains that the various phenomena exhibited by gases such as their contraction under pressure and the increasing pressure they exert when contained and subject to an elevation of temperature, can be explained if the gas were composed of minute particles in free motion colliding with the sides of a container. From this hypothesis, Joule, using very simple algebra, was able to arrive at the average speed of such molecules. In this determination, he assumes that the gas contained in a cubic container is amalgamated into three particles, each of which collides back and fourth between opposite walls of the cube. He thus calculates the velocity, 6225 feet per second, that would be required for these particles to maintain the measured pressure. Joule published these results in 1851. In the mid-1850s, Joule experimented with various improvements to the steam engine at a laboratory outfitted in in stable of his father's country home. He was later given a grant by the Royal Society of London to conduct research on the surface condensation of steam, reporting his results to the society in 1860. This work led to important improvements in the design of the steam engine. During this period, Joule worked closely with Lord Kelvin, who was often a visitor at Joule's laboratory. Joule performed experiments on gases, and demonstrated that when a gas is allowed to expand freely into a vacuum, it cools slightly, an effect attributed to the work expended in overcoming intermolecular forces. According to the kinetic theory, the temperature of a gas is roughly proportional to the square of the mean velocity of its molecules. When the mean velocity of the molecules decreases, the temperature drops. It has been found that at temperatures elevated substantially above room temperature, the temperature of a gas may increase upon expansion because molecules spend less time slowed down due to their collisions with one another and with the sides of the container that hold them. In 1878, the British government, in recognition of his contributions to science, granted Joule a pension of 200 pounds sterling, which he received for the remainder of his life. Joule died at home in Sale and is buried in Brooklands cemetery there. The gravestone is inscribed with the number "772.55," his climacteric 1878 measurement of the mechanical equivalent of heat, and with a quotation from the Gospel of John, chapter 9, verse 4, "I must work the works of him that sent me, while it is day: The night cometh, when no man can work." The unit of mechanical work called the joule was named after Joule and represents the quantity of mechanical work expended in applying a force of one newton through a distance of one meter. Joule's theory of the inter-convertibility of heat and work at a fixed rate, along with the careful experiments upon which he based his conclusions, were the bases upon which the caloric theory of heat was finally overthrown. The caloric theory had been a stumbling block that slowed scientific progress. Joule also was among the first to attach a number to the speed of molecules, a feat that was lacking in previous theories of the kinetic theory of heat. All of his work, however, was accomplished while he adhered to a belief in an eternal and benevolent God as the creator of the universe. Joule saw the beauty and harmony of nature and its underlying laws as God's handiwork. 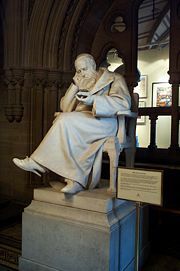 A statue of Joule in the Manchester Town Hall. ↑ J.P. Joule, "On the heat evolved by metallic conductors of electricity" Philosophical Magazine, 19, 260: 65. ↑ J.P. Joule, On the rarefaction and condensation of air, Philosophical Magazine, Scientific Papers, 172. ↑ Chemical Section, On the Mechanical Equivalent of Heat. Retrieved April 10, 2008. ↑ J.P. Joule, Philosophical Transactions of the Royal Society of London, 140:61-82. Beach, Alfred Ely. 1875. Italic text. New York: Munn & Company. Bottomley, J.T. 1882. 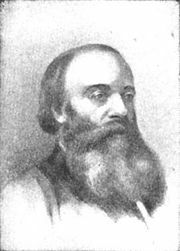 "James Prescott Joule." Nature. 26:617–20. Joule, J.P. 1965. The Scientific Papers of James Prescott Joule. London: Dawson's. Reynolds, O. 1892. Memoir of James Prescott Joule. Manchester: Manchester Literary and Philosophical Society. Sibum, H.O. 1994. Reworking the mechanical value of heat: instruments of precision and gestures of accuracy in early Victorian England. Studies in History and Philosophy of Science. 26:73–106. Smith, C. 2004. Joule, James Prescott (1818-1889). Oxford Dictionary of National Biography. New York. Oxford University Press. Thomson, William and Lord Kelvin. 1894. Popular Lectures and Addresses. New York: Macmillan. History of "James Prescott Joule"
This page was last modified on 19 March 2018, at 22:21.